My love story with the Himalaya skin products started with the Himalaya Herbals Purifying Neem Face Wash. My acne – prone skin had great relief and the pimples were no more. I was happy. So was my skin – soft and supple and glowing with the goodness of neem. But problems never seem to abandon me as far as my skin is concerned. Once I had heavy make up on on my cousin’s wedding. And before the night was over, my skin started itching. There were red spots and a burning sensation. I removed the make up with a regular soap and also used neem face wash. But the aftermath of putting on make up taught me that my skin needed extra care as far as removing the everyday dirt and make up is concerned. 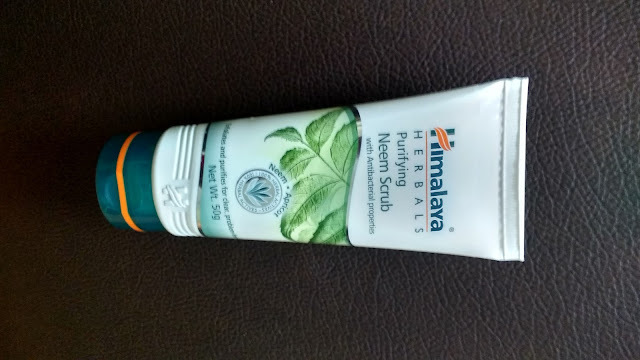 Himalaya Herbals Purifying Neem Scrub Review - How The Himalaya Neem Scrub Changed My Life? With my loyalty already fixated on Himalaya herbals neem products, I decided to try the neem scrub. The pack comes in the usual Himalaya tube with a flip – top. 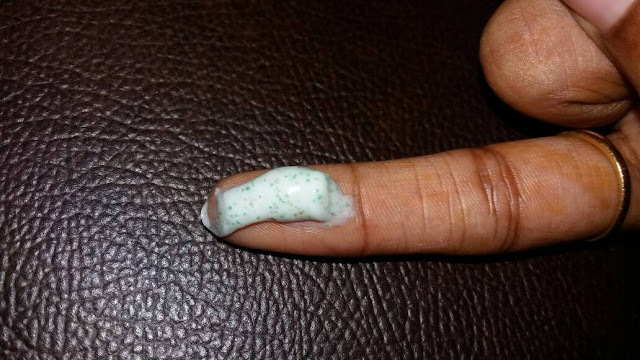 The gel is off – white in colour with very small orange and green coloured granules. The first time I used it, I was a bit doubtful about the effect the granules were going to have on my sensitive skin. But, the feeling was totally different. There was no scratchy sensation at all!. There was the mild fragrance of my favourite neem leaves. After I washed off the scrub, I also washed my face with the face wash. The after – effect was magical. Again! My skin was as good as new again. The blackheads were almost invisible. Since that day, I have been using the scrub every night before going to bed. All those parts of my face that suffered due to my moving about outdoors extensively, with the excessive dirt and sweat, are now much under control. I am relieved to find that I can put on heavy make up without any fear. Only thing is that I have to maintain the strict regimen of scrubbing my face everyday with Himalaya Herbals Purifying Neem Scrub. If you don't wear heavy makeup or don't leave your skin in more polluted area, you do not need to use the scrub everyday. Using the scrub weekly twice or thrice is more than enough. Himalaya Herbals Purifying Neem Scrub can be used By all regardless of the skin type. This scrub is easy to use, easy to carry and easy to remove from your skin. All your blackheads and zists will be taken care of with regular use. For ladies with acne – prone skin, can try this safely as I have already got the evidence that it can do miracle to my skin. Only a small word of caution, the granules, though extremely minute, can cause irritation in some. So try out a small pack first before making Himalaya Herbals Purifying Neem Scrub your everyday companion. Thanks to Himalaya Herbals for this amazing Himalaya Neem scrub. Hope you liked the review of Himalaya Neem scrub. Stay tuned for more reviews.